Today's Draw: Two of Swords in the Crowning Influences position from the Mythic Tarot and the Deck of 1000 Spreads. Do you feel caught between a rock and a hard place? Do you know what you want, but seem to be paralyzed in moving toward it? How long do you think you can stand with one foot in your old life and one in your new? Poor Orestes. Mom and Dad are having a fight and he's caught in the middle, refusing to pick a side. 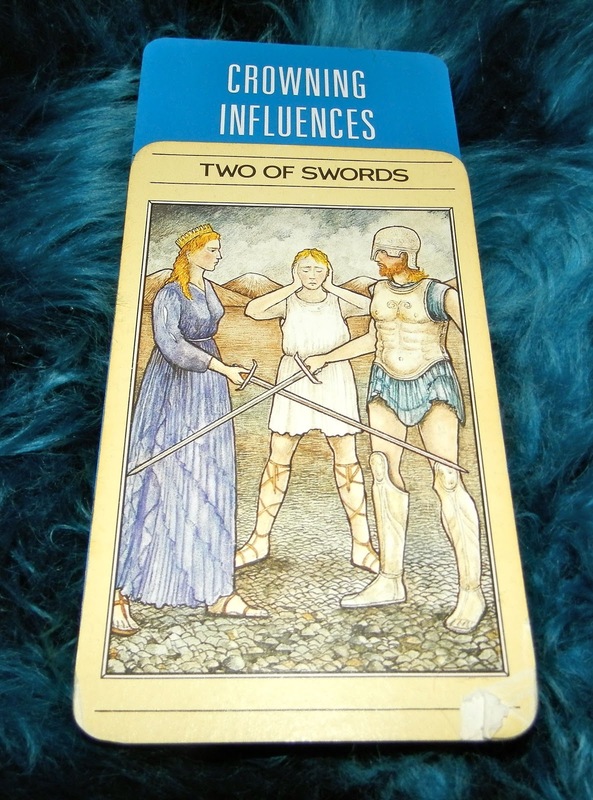 The Two of Swords speaks to a situation where you feel paralyzed. Maybe there's a reality you're refusing to face. Or stormy seas in your life you're choosing to ignore. Or a precarious balance or neutrality you're trying to hold. Whatever it is, there's usually some need to move forward, but a fear-based inability to do so. In the Crowing Influences position, it fits right into this week's theme of making changes and moving forward in our lives. The Crowing Influences position says that what's holding us back is the fact that we've got one foot in our old world and one foot in the new. Yesterday was all about making the decisions. And today is, too. This one foot in/one foot out thing is causing tension and anxiety within that is adding to our fear and uncertainty. In fact, a large portion of what we're experiencing as fear and anxiety may really just be the tension and anxiety of standing between two worlds. We can't stand like this forever. And no matter which direction we choose, it's scary. It's scary to stay the way we are. And it's scary to move into the unknown. But the difference between the two is that you know what the status quo holds. And you've chosen to step away from that toward an uncertain future that holds either something more beautiful or more horrific...haha. Are you trading your problems? Are you walking away too soon? Those are legitimate questions, but ones that also keep you stuck. Which possibility makes you feel larger? Which possibility calls out to you? Which possibility holds the most potential? Those are the questions to ask. I know a couple of people who are considering ending their marriages. One of the wisest things I've ever heard Dr. Phil say is that "you have to earn your way out of marriage." That means you can't leave before you know you've done everything you can to save it (unless you're being abused). And THAT means you have to do things like counseling and trying different ways to approach problems. You have to take responsibility for your 100% of the relationship and do what you can do to change the situation, even if your partner's 100% is not cooperating. I believe that a lot of marriages end prematurely. I look at people who have been together for 25 or 30 years and still love each other, and what I see is two people who stuck together through things that tore others apart. Marriages deserve that chance. Families deserve that chance. But when it comes to things like careers and where you live and the other details of life, you can spend a lifetime on the fence only to discover you've never lived. As many of you know, I had a brother who was seemingly healthy one day and less than six months later was dead of cancer. He died with two feet firmly planted in the midst of his family. He knew what he wanted and he went for it. You know what you want, too. So which foot will you move? Because I forgot to mention that the Mythic Tarot is the deck I learned on and it's a good deck for that. All the suits are wrapped up in a story from mythology and that makes it easy to learn the card meanings. See how the corner is ripped? This deck is like those old cotton sheets you have that look like crap, but feel good to the touch.